How do I get to a 100% complete venue listing? This is also sometimes referred to as your Content Quality Score (CQS). Your venue listing score directly affects how visible your venue is in search results, AND how likely you are to book events via Venuemob. So, it's important! 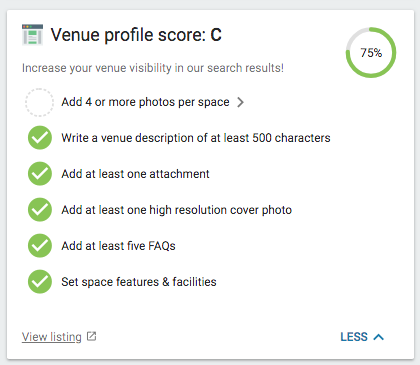 Your venue profile score is made up of multiple content components on your profile, including: description, space images, cover image, attachments, and FAQs. Head to Venuemob Manager, and you'll see your current score in the home page. The more content on your listing, the higher your score, and the higher you'll be placed in our search results. Description: we require a venue submit at least 500 characters describing their venue. Space images: we require a venue upload at least four images per space. Cover images:we require a venue upload at least one high resolution (1900+ pixels wide) image be uploaded. Attachments: upload at least one PDF, like function packages, menus, drinks menus (all with pricing!! ), or floorplans. FAQs: add at least five FAQs. You can easily boost your venue profile score by adding more content. 100% complete listing? Setting and editing your minimum spends/hire fees or also makes your venue more visible to customers. Plus, adding min spends means you'll be at least three times more likely to receive a booking request than venues without. Price guides are a handy tool for customers, allowing them to see whether their budget falls around this range. Adding offers is another great way to boost your venue's visibility in search results. While this does not affect your profile score, it does boost you to the top of search results for relevant event types. You can choose your discount, applicable dates, as well as any conditions, such as spend requirements.